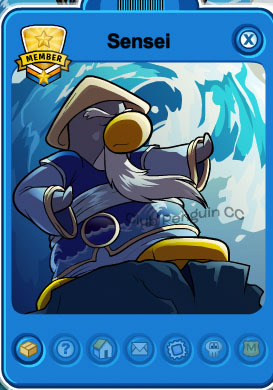 We have created a Sensei Tracker to help you find Sensei when he comes to Club Penguin. Sensei often hangs out in the Ninja Hideout when he visits. The tracker will begin working as soon as Sensei arrives. When looking for Sensei on your own, be sure to check the popular servers. This includes, Blizzard, Mammoth, Sleet, Abominable, and other servers with 5 bars. If you see a server that is generally empty with 5 bars, there is a chance Sensei is on that server. You will be able to find Sensei in the Ninja Hideout and the Fire Dojo. Be sure to check out the Cadence Tracker, Aunt Arctic Tracker, Gary Tracker, and Penguin Band Tracker as well.